With the release of Visual Studio 2008 device unit testing or in fact desktop unit testing is now built into the IDE which makes unit testing alot easier than before. 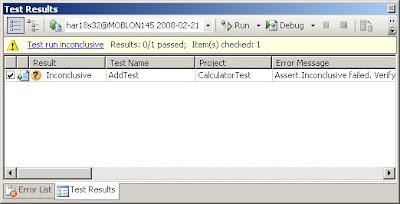 Note device unit testing is only supported on Visual Studio Team System 2008 with Test Edition or Team Suite. See here for a Visual Studio product comparison. If you would like to learn more about what agile unit testing is see here. With Visual Studio 2005 there were tools such as Test Driven.net, NUnit, MBUnit typically were used and still are today, in fact we still use NUnit mainly because we like it, it works and we have hundreds of tests written using it. There are differences with the above tools, we chose NUnit because it was ported from JUnit which worked also. 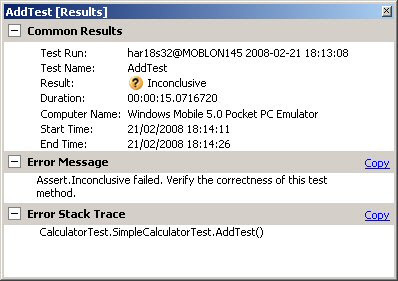 This article will cover how to use unit testing on a Windows Mobile device and show how simple it is. In fact I am very fond of it as it does in fact do alot of work for you that NUnit doesn't. Also the difference with the VS unit testing over NUnit is that in VS the unit testing is integrated in the IDE. There are two ways to create unit tests in VS 2008, one is to create tests from production code or to create them by hand. Of course it is less work to create the tests from production code so this is what I'll talk about in this article. As you can see, it is very simple. 2. 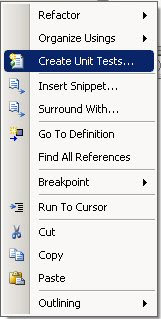 Right click the source for which you would like to create the test project, then select "Create Unit Tests..." option. 3. Select the method for which you would like to create the test. 4. Clicking on "Settings..." button will allow you to configure how the unit test wizard will create your test. Most of the options are self explanatory. I always change the name to the name of the class coupled with "Fixture" ie in this case "SimpleCalculatorFixture". It stems from NUnit days. The only option that needs to be clarified below is the "Mark all test results Inconclusive by default". This option forces the test to fail when run because it is not implemented. Of course it is good practice to honor this setting. 5. 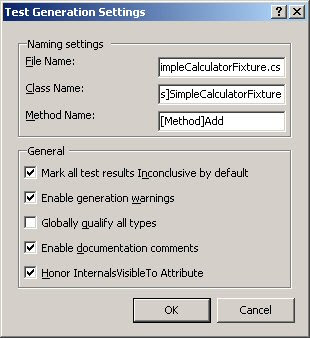 Clicking OK to the Test Generation Settings dialog then click OK again on the Create Unit Tests dialog will prompt you to enter a name for your new test project, enter a name and click OK.
6. After completing the above Visual Studio creates the test project and some test methods. quite neat when you think in the past you'd have to do all this yourself. As you can see from the above test code, it is very similar to how things are done using NUnit. Notice the similar attributes used to mark methods. The most notable one being the TestClass attribute the NUnit equivilent is TestFixture. These attributes and all testing methods etc can be found in a simple assembly named: Microsoft.VisualStudio.TestTools.UnitTesting.dll. You don't need to add this to your test project because Visual Studio has already done this for you. It doesn't get any easier than this!! Many of the methods VS has added for us such as MyClassInitialize, MyClassCleanup etc are commented out they have been added for ease of implementation if required. 7. Now we have everything in place, lets see what happens when we run the test, bearing in mind we haven't written any tests yet, we have simply let VS do its job and create a test project for us. Now running the test will execute the above, of course the line Assert.AreEqual will fail because we have already written our production code which adds the two numbers together so the result of this method call will not be equal. Visual Studio has guessed here what the likely result might be, clever but not quite clever enough! The test adapter ('Microsoft.VisualStudio.TestTools.TestTypes.Unit.UnitTestAdapter, Microsoft.VisualStudio.QualityTools.Tips.UnitTest.Adapter, Version=9.0.0.0, Culture=neutral, PublicKeyToken=b03f5f7f11d50a3a') required to execute this test could not be loaded. Check that the test adapter is installed properly. Exception of type 'Microsoft.VisualStudio.SmartDevice.TestHostAdapter.DeviceAgent.NetCFNotInstalledException' was thrown. I wrote a blog regarding this error a while back here. This basically means .NET CF 3.5 is not installed and VS doesn't deploy .NET CF 3.5 before executing the test if required even though the option under the test project properties Devices tab "Deploy the latest version of the .NET Compact Framework (including service packs)" is set. 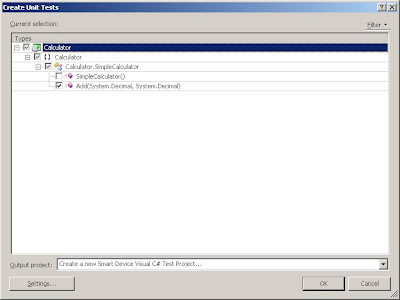 You can simply deploy a Windows Forms application with the above option set and VS will deploy CF 3.5 just as it's always done, if you don't have a Windows Forms application, deploy the CAB file to the device/emulator manually then run it. After this the tests should execute. 8. Now I have fixed the above problem, lets try running the test again. This time I get the following results in the new Test Results window. From the above Test Results window it is difficult to read the error as to why the test failed. Double clicking the error row loads the properties window for this particular test which gives us some more information as to why the test failed. We have simply removed the call to the static method Inconclusive. Suprisingly, the test passes. It's not really that suprising because if you look at the AddTest method above, you'll notice that VS has created an instance of two decimal objects which both will be 0 and declared a returning type which isn't instanciated, but the AddTest method creates it and passes it back to the test method. So we are performing this calculation: 0 + 0. Of course the result will be 0 which is why the test passes. Explore the Assert class, there are many methods to use against your tests much like NUnit. It seems the Testing framework in VS 2008 was built on NUnit and I like it alot! hi there, could u answer a quicky? i got VS2008 Team System installed but i can't find the Microsoft.VisualStudio.TestTools.UnitTesting namespace in the GAC, what's missing, Thanks. Could u open the coverage option? When i open this option, would get the error "System.MissingMethodException: MissingMethodException"
There is no support in MSTest for setting the priority. Unit tests should be independent. There is support for setup and teardown though. Can you confirm or not whether Visual Studio 2008 Professional not provide Unit Testing capabilities for devices? Yes you can unit test in VS 2008 Pro edition: note professional is the minimum for smart device development in VS 2008. Also note you won't have code coverage support for your unit tests in VS 2008 pro though. You need team system editions for this. Debugging unit tests is not supported on devices. A work around is to change the host type (in the testrunconfig) to default - although this only works if the unit test is not dependent on device specific APIs. Alternatively, you could write a stub and abstract the test into a separate library that gets called by the stub - not perfect but a workaround. Additional information: The system cannot find the file specified. I get the same results with the emulator or my target device, is there something I am missing in VS2008? I am using Visual studio 2008 Team System SP1. I need to perform Load Testing, but when I am going to add a "Load Test" after clicking the Add Tab only "Unit Test" and "Ordered Test" is comming not other options as I saw in the How Do I? videos. Can u plz help me out from here..
here also in the right pen I am getting only two options "Unit & and Ordered" test.